Flower essences are a form of botanical medicine created from the flower of the plant, and are used to uniquely address the emotional aspects of our wellbeing. Flower Essences are liquid, energetic remedies derived from living flowers. What this means is that they move and shift your vibration. Another way to look at this is to think about how each person has a spirit or essence. The same is true for every flower, tree or plant. When you ingest a flower essence, you are met spirit to spirit. The essences work to bring not only an awareness, but also to release patterns from the subconscious to the conscious mind so that healing can occur. Most of us are looking for ways to exist and relate in the world in conscious and authentic ways. But sometimes we find ourselves cutting off from love, saying 'yes' when our hearts are saying 'no', caretaking others at the expense of our own health, fearing judgement by others... and on and on. Flower essences shift deep-seated beliefs and patterns that have often imprinted in childhood and are still “in charge” into adulthood. They work to bring not only an awareness but also to release patterns from the subconscious to the conscious mind so that healing can occur. 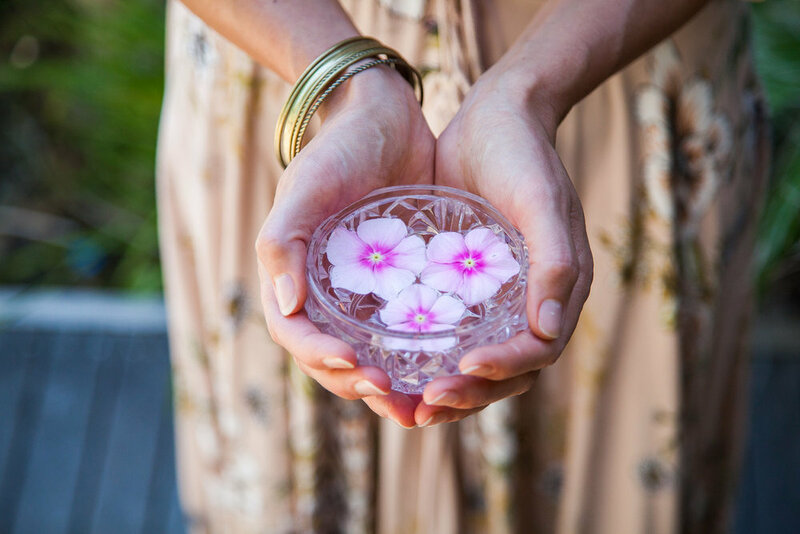 Flower essences have been used for centuries in many cultures for healing, for ceremony, for spiritual development. Most recently, a British physician, bacteriologist, and homeopath named Dr Edward Bach reintroduced them into our culture. Flower Essences are distributed in dropper bottles and a small amount of brandy is usually added which acts as the presevative. After the bottle is shaken gently, a few drops are taken under the tongue several times during the day. Flower essences can also be sprayed or rubbed on sensitive parts of the body such as the inside of the wrists, the soles of the feet or the back of the neck. They can also be added to bath water. The response to taking flower essences varies person to person. Some people report immediate and profound results, and others may perceive slight shifts in well being and in mental and emotional states.